I first fell in love with Tom Stoppard's work when I saw Arcadia in London in 1994. I was studying British film, theatre and culture for a summer and our class attended the play. Out of the roughly 15 students in our group, I was one of three who really grokked it and the inspiration stuck. My knowledge of Byron left much to be desired, but having a rough understanding of chaos theory and a love for British repartee, I was hooked. Stoppard's unique talent of intertwining seemingly unrelated themes provided for me a realization that it is possible to create poetic intellectual works for the theatre. I went back to my dorm room on Gower Street and proceeded to write a play over the weekend. Nothing came of the play, of course, but the theme I chose was the fall of Soviet communism in Russia and it included a love story between a British man and an American woman for a subplot. Fast forward 14 years and I'm reading Stoppard's latest, Rock 'N Roll, into the wee hours before going to see him the next morning at A.C.T. and it's about the fall of Soviet communism in Czeckoslovakia and includes a love story between a Czech man and a British woman. I'm of course oversimplifying both works, especially his since it dealt largely with music censorship, briefly engages in some notions about capitalism, and deals also with the question of the eternal soul, but I felt myself falling in love with Stoppard's writing again after fourteen years, like being reunited with a favorite wine or dessert, relishing the aroma and the taste of every word I read. And it seems I'm not the only one, since tickets to the event sold out (as much as you can "sell" free tickets) in the first fifteen minutes they were available. Carey Perloff opened by saying something along the lines of how Stoppard mentioned in the program notes for one of his plays that sometimes "the play writes itself." Stoppard jumped right in: "you have to give it a lot of help..." he said something like "the play telling you what it wants to be about." (Audience: LOL) The playwright then went into the example that he wanted Rock 'N Roll to extend to 1997 when Plastic People of the Universe reunited at Vaclav Havel's request for a concert. This makes a lot more sense if you've read the play, but his point was that "the love story, in a strange way, is what it's really about." Anyway, Stoppard went on to say (I'm paraphrasing or possibly quoting) that the protagonist was making the point that the revolution (in Czechoslovakia) was not to replace one system or another... What he did say was "by the time you've experienced a few years of democracy, you begin to experience some of the freedom." But - Stoppard said - the play had no interest in going on after 1990. He couldn't get to why there's a down side of freedom. (Audience: LOL) This is because the play was really a love story, about the characters, not about the band. The discussion then turned to the autobiographical nature of Rock 'N Roll, the work most closely reflecting Stoppard's own life. In the original version, the main character, Jan, had been named Tomas after himself. As the play evolved, Stoppard realized that although it overlapped with his own life for two years while in England, the "self-reference became loose" thereafter. Here Stoppard delved into some of the essence of his work: "Almost every story is really two stories," he said, "one that's ephemeral... even things which look permanent like the Soviet regime are not." The personal, he said, is why the political had nowhere left to go. "It's really quite frightening (if one cares to be frightened) how much is intuitive..." Another quote: "you have to be brave to know much less than you think you have to know to write the play." In other words, don't over-think your writing. Stoppard then described a story about how his father was one of 7 Jewish doctors from a certain group that fled Czechoslovakia and how years later he met a woman who had a scar on her hand from when his father had sewn up a cut. The only thing he had of his father was the scar on this 70 year-old woman's hand. He mentioned this as an example of the kinds of details in our lives writers can infuse into our work. Rough cut to Stoppard's interlocking themes. "If I were a critic, I now see that this mania for cross-reference in a play to be the signifier..." [of his work]. That is a common identifier, for certain, but his use of language is as well (see 'Stoppardian', above) and he tends toward romantic plots or sub-plots as well. At this point in the discussion, The Coast of Utopia became the topic. The play was recently performed in Russia, in Russian, and the actors rehearsed for a year and a half. This, for those who know theatre, is incredible. Stoppard went on to describe how that sort of rehearsing transpires in a small theatre. And the topic of actors turned to characters. "I've never considered character to be my strong suit." "There are writers... writers I admire very much, who are much more driven by human traits..." "If you get into a play because of an idea, then character has to come from behind..." As to his life as an anglophile, Stoppard noted his love of the English garden and the English landscape, but indicated his distaste for the growing Orwellian sense in British government, "we have more CCTVs than any other country in the world." But he said of his affinity for his adopted country "some of it is from this sense of unconscious gratitude." "To my mother, we were kind-of saved by this English officer and brought to [that] wonderful country. What a stroke of luck." Regarding writers who inspired him, "I had huge passions when I was young... for Ernest Hemingway. For years, not for a short period... I think he was my favorite writer right through my twenties... they were mostly American writers... I loved American writers. I loved America... I'd never been here." "I used to really look forward to Friday when Time and Newsweek came out. I found America completely fascinating. The arguments I used to have with friends were actually arguments like - Hemingway or Fitzgerald." "America was a very glamorous country when I was in India as a small boy. Its glamor was blinding. The comics, the candy wrappers, the uniforms of the American soldiers in Darjeeling. Everything about Americans was glamorous in a way that English were not." "I only have to pick up a Hemingway book and read a page and I feel exactly as if - first love again." I know the feeling. What's next for Tom Stoppard? While the playwright said he's not quite sure, I have a proposal (from Elizabeth Stiletto to William Boots): America. Ernest Hemingway, WWI and America. Or Hemingway, journalism, and America. Here's why: Stoppard noted his interest in the use of the theatrical device of the aside, particularly in respect to his recent work translating Checkov. Hemingway's writing and his character lends itself beautifully to that - the way it flows and the characters' journeys. Hemingway was born in Chicago, spent time in Northern Michigan and lived briefly in Kansas City. Each of these locations could provide ample plot fodder. I prefer Kansas City since I grew up there - rumor had it Hemingway lived in the house behind ours - it had a bell tower. And of course romance. That's easy. Hemingway's story is full of it. America's story is full of it. 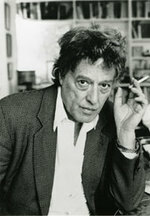 As a writer, I know Tom Stoppard needs to find his own path for his next play, so I won't dwell on my idea being of any use, but Sir Tom, if you see this, please consider America. Meanwhile, we look forward to your next visit to San Francisco.